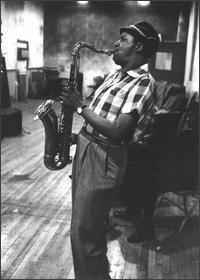 American jazz saxophonist (tenor) and composer. Born : January 24, 1920 in St. Louis, Missouri. Worked with : Eddie Johnson (pianist), Fate Marable, Don Albert, Jay McShann, Andy Kirk, Duke Ellington, Harry "Sweets" Edison, Count Basie, Al Grey and many others. His best known composition was 'Night Train', composed with Lewis Simpkins and Oscar Washington. At the time of his death, Forrest and Al Grey were the leaders of the The Al Grey-Jimmy Forrest Quintet. Jimmy Forrest Theme From "Experiment In Terror"